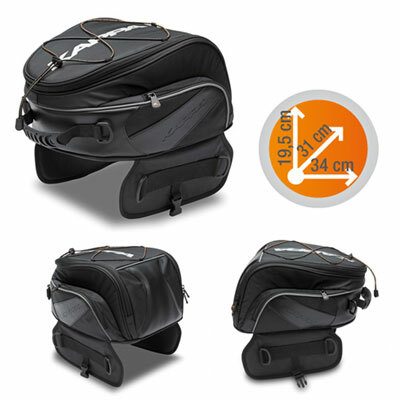 turned into a bum bag Tail pack with a large central compartment, comfortable external pockets and a practical padded area, that can be used as a backrest for the passenger's comfort. Material: 840D Polyester + 1200D textured Polyester with inserts in simulated leather and EVA finishing. Mounting kit: kit of elastic straps for the anchorage to the bike.